The music of Carl Philipp Emanuel Bach was highly esteemed by his contemporaries. Haydn, Mozart and Beethoven all held him in high esteem and Mozart would even write to his father "He is the father and we are his children…" while Brahms showed his devotion by arranging and publishing two of C.P.E. Bach's violin sonatas. Johann Sebastian Bach is credited with having "created" the first concertos for a keyboard instrument and orchestra. His son Carl Philipp Emanuel would later develop and enrich the form even further composing at least 53 keyboard concertos of his own. 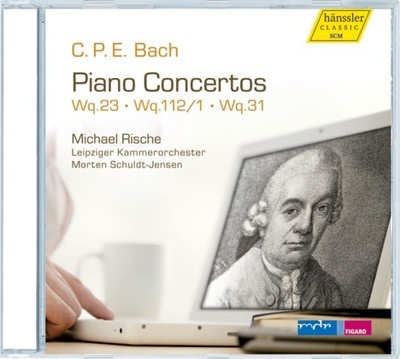 The richness and variety of Bach's invention can be heard on the remarkable works that Michael Rische recorded here. Michael Rische has been hailed as an advocate of forgotten masterworks, including the piano concertos of Erwin Schulhoff, and George Antheil. Rische now tackles the works of Carl Philip Emanuel Bach, a composer whose works embody the same passion, and Sturm und Drang, as Schulhoff and the same bold spirit of exploration and experimentation that can be found in the music of Antheil. With Michael Rische at the keyboard, C.P.E. Bach's music is in good hands!